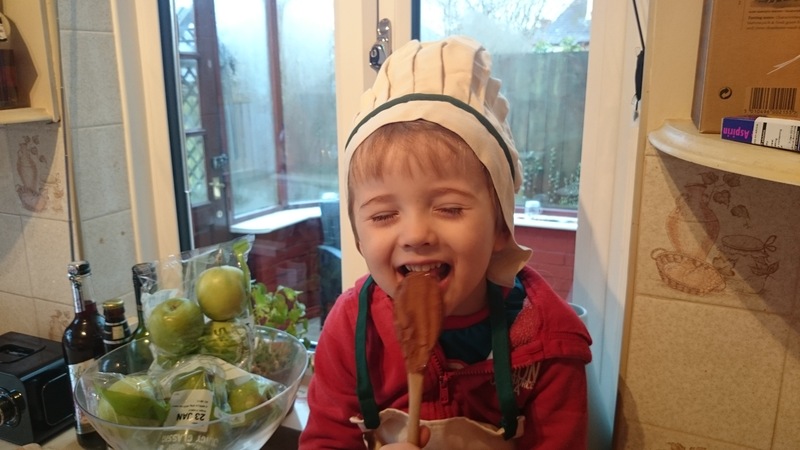 Little Man loves helping us out in the kitchen, or watching us as we cook, so for Christmas we bought him his own apron and mini chef’s hat which he loves and has worn on more than one occasion to make Play-Doh cookies. 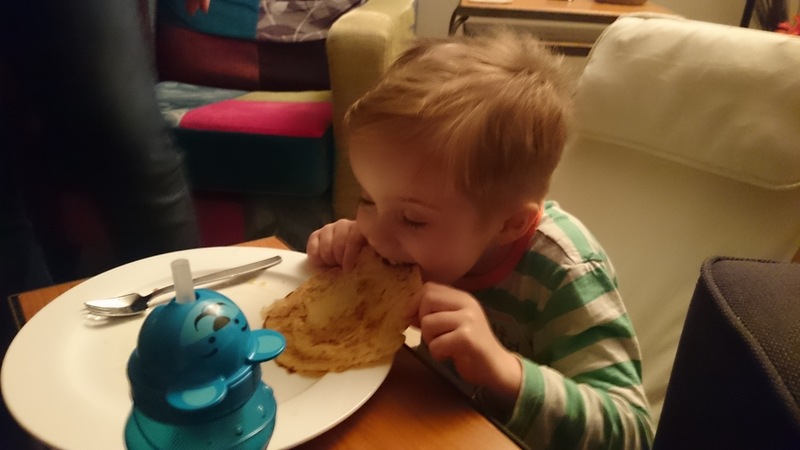 We are definitely foodie parents and it’s important to us that Joe is interested in the food we eat and is willing to try new things (not always easy with a child as lots of you will know!) but he counts Daddy’s chicken and chorizo paella as one of his favourite dishes now, along with Mummy’s lasagne. Getting hungry now myself. 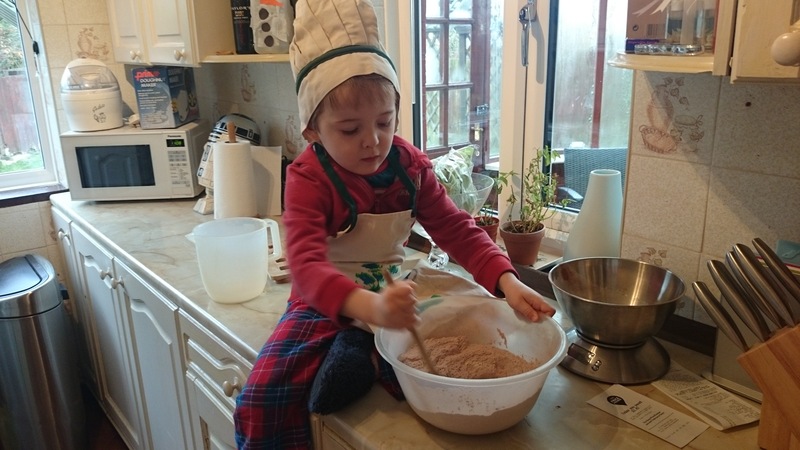 Of course he still loves fish fingers, chips and beans but he always gets in on the action for making Sunday dinner – it is his job to help make the Yorkshire pudding mix, and he always remembers the quantities of ingredients. And he gets to use the hand blender (with supervision!) which means we always have well-aerated Yorkies. He’s often less enthused when it comes to eating his vegetables but he’ll always eat the small amount we put on his plate – albeit with some encouragement. 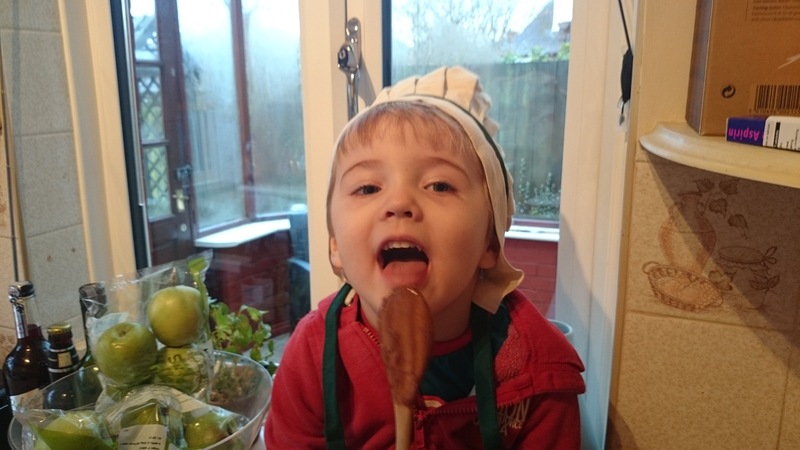 One thing he does love is baking – helping to stir the ingredients and of course licking the spoon! 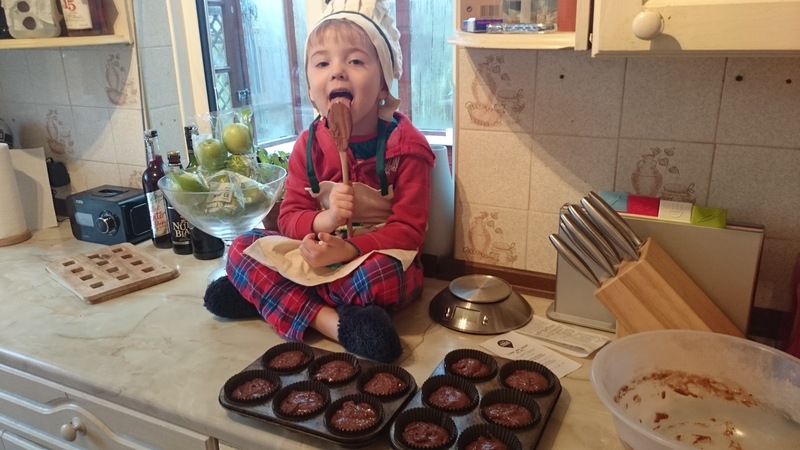 Here he is in customary chef’s hat on the kitchen counter making chocolate muffins. Much has been said in the media about childhood obesity and the importance of educating children about healthy eating, but I think children learn their eating habits from their parents, and we have a responsibility to protect his current and future health by setting a good example. There is a place for chocolate muffins and other treats, but only as treats, and he understands this. 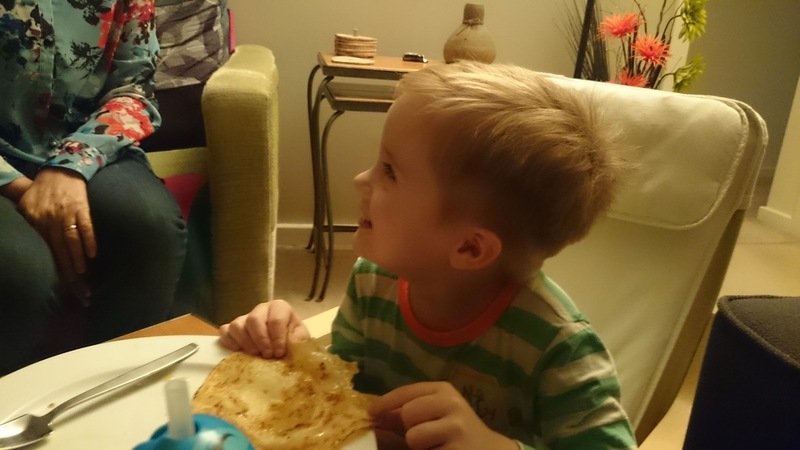 He is lucky to be given well-balanced menus at nursery during the week, and we are grateful for this as we don’t have to worry about what he is eating while he is there. He has never had sugary soft drinks and isn’t really a fan of sweets (although chocolate is a different matter!). As a result of all this, and the fact that he is permanently on the go, we are growing ourselves a little string bean of a son, with long limbs and trousers that fall off his waist – but he is healthy, a good weight for his increasing height, and is appreciative of the food he eats. 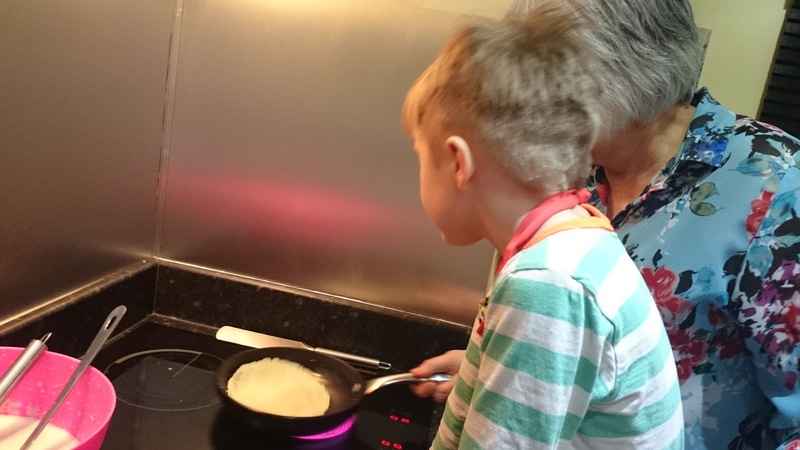 I hope that as he gets older his interest in cooking will continue – he certainly enjoyed watching Grandma make pancakes for Shrove Tuesday. And eating them, obviously. 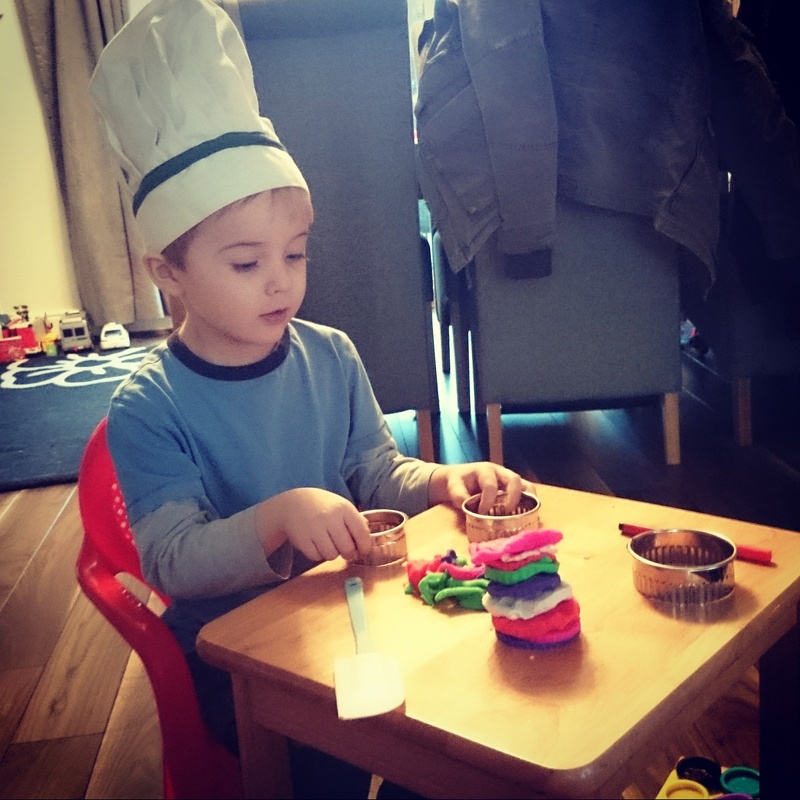 It is nice to think that he will be able to fend for himself in the kitchen one day – and maybe even eat all his vegetables. 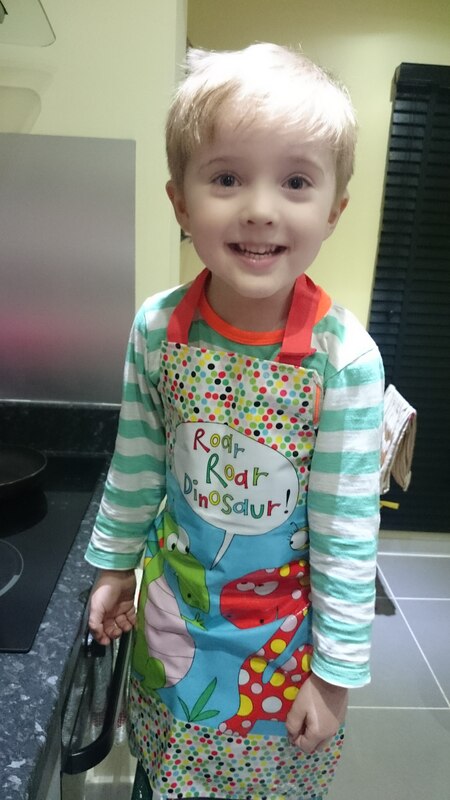 I love love that dino apron!! I totally agree with you. Teaching kids to cook and bake has so many benefits. I’m lucky that Potato will try most things too, even if he sometimes needs lots of encouragement with the veg! It really makes my life easier as I love food, especially trying new and interesting dishes.